In a world where everyone was against them, they needed a Miracle. What no one had expected was to find their salvation in an abandoned town that was ready to collapse. Yet, that is exactly what happened when they moved to the town of Miracle, Oregon. Kellach Alder hadn’t been given a chance in life to be the man he knew he could be. It never occurred to him that if he wanted others to see him differently, he would have to stand up and be the person he wanted to be. Trygg Snow was sent to kill Kellach and his friends. Already conflicted about his mission, Trygg knew he wouldn’t be able to complete his assignment when he came face to face with his mate. 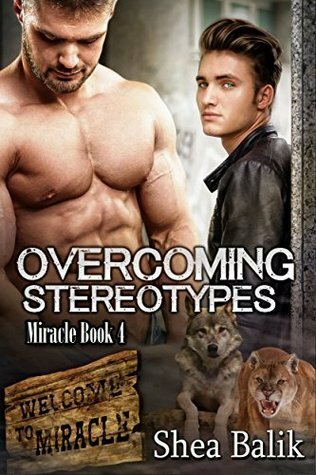 If only Kellach, a mountain lion shifter, would look past the fact that Trygg was a wolf shifter. Against all odds, and an army headed their way to destroy them all, Trygg and Kellach must find a way past their differences if they are to survive. The only way to achieve that is by Overcoming Stereotypes.